Hello everyone, Once again the 3Ghackerz is back with amazing Free Mobile Recharge offer of Rs.100 for all users. Hope you like the amazing Mobile Recharge loot offer because it is amazing loot. Via.com app has came with amazing promotional offer. 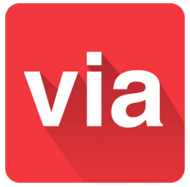 Via.com app providing Air Ticket, Bus Ticket and many more at cheapest rate. But today they came with big loot. Now you will get Free Rs.100 Mobile Recharge from VIA app. This is the big loot. Via app present Refer & Earn Free Recharge offer. Just refer your 5 friends and you will get Rs.100 Mobile Recharge. On each referral you will get Rs.20 also your friend will get Rs.500 discount voucher as joining bonus. So just download the Via app and refer your friend and get Free Rs.100 Mobile Recharge in few minutes. This is the big loot offer for all users .So hurry up and grab the amazing loot offer and get Rs.100 Recharge in your number. Now the Terms & Condition has been changer, You will get Rs.100 Mobile Recharge on Refer of 10 Friends, Previously you were getting Instantly Rs.100 Recharge on Refer of 5 Friends. But now you have to wait 48 Hours to get Recharge after redemption of Recharge request. You can redeem your Rs.100 Recharge one time in a Week. Click on GET IT ON Google Play. Now click on Get Rs.500 Sign up bonus option in home screen pop up. Enter your Mobile number & click on GENERATE OTP. Enter OTP & Now Login via Google or Facebook account. Click on top upper left Menu option. You will see Rs.100 Free Recharge offer. Click on Share & Earn. You will get Rs.10 on each referral. Finally you can get Rs.100 Mobile Recharge on just refer of 10 friends only. Enjoy the amazing loot offer of free recharge. Click on Sigin with VIA then click on Sign up. So hurry up and get unlimited recharge. awesome..man..got..referal..reward..but…they r not giving recharge telling..due..to..some..technical.problem…and..will..be..back..in..few..days..
and one thing i must say that..i love..your..blog..lots..of..tricks..i..got..from..your..site..which..i..didnot..get..from…other..blog..
@Saikat, so many people looted more than Rs.1000 also i looted Rs.1500. So thats the reason VIA server down. I hope they will back with recharge service. Thanks Admin.....I Am Try This Free Recharge Offer And Its Work Perfect. Also Unlimited Trick Work Perferct. Bro ye device I’d change kaise hota h plz help? Parrelal space me kam nhi kar rha kya?